I never intended to run this event, but Tracy convinced me to sign up by asking, “When will you ever get the opportunity to represent your country by running in your home city?” This made too much sense at the time, so I forked over the kidney, arm and leg required to enter; by the time I paid for registration, temporary membership and uniform, I had parted with well over $300 to run a marathon! After finishing the WTF50 mile event at the end of September, I took a week off running to recuperate and re-gather myself. After that hiatus, I wanted to start preparations for the most expensive running thus far in my limited “career”. Murphy would have other plans though. Tracy came home from work one night, bringing with her some of the germs from a client office. The next three weeks were an abundance of snot, rasping coughs and wheezing lungs. Needless to say, this was not the best preparation! With less than two weeks to go until the event, I finally started to feel good enough to do a little proper training, but it was way too late to try and squeeze my standard three weeks plateau training into a single week and still find time to do a proper taper, so I did a little of both, poorly! On Saturday before the event, I took my custom hydration bottles and gels to the WAMC rooms at Burswood and placed them into their respective buckets for transportation to the course the following day. Some people had done some really interesting artwork on their stashes to make them easily visible when placed in amongst other bottles on the tables at the drink stations; I simply use some duct tape and electrical tape and write my details on these using a permanent marker. It’s worked before, so I was assuming it would work again?! My preparation for this event had been awful. I knew I’d be able to finish the distance, but there was no way I’d be able to attain a personal best and baulked at the idea of even trying for it. A friend, Ian Nichol hadn’t had the best preparation either, but still had a goal to run sub-4hours for the first time. Just before the start I mentioned to Ian that I would not be “fast” today and asked if he wanted me to pace with him to attain his sub-4 marathon; he said yes. We queued at the registration desk for an eternity as the event team tried to get everyone through pre-race formalities (made more difficult by technology, strange processes, language difficulties and people not listening to instructions). Our start was delayed and delayed again, until finally the organisers thought they had everyone through the registration process (it turned out one or two stragglers hadn’t). Ian and I made a quick scurry from the clubrooms to the start corral and then we were off! We headed towards the Causeway and tried to find our space to run in, passing slow starters and getting passed by faster runners ourselves. We admired one Japanese runner who was huffing and shuffling along in the first kilometre of the 42km event, to be told by a runner with a broad Irish accent that the Japanese competitor was the oldest runner in the field at age 85! (The Irish runner was age 76.) Within a couple of kilometres, the field had basically sorted itself out and everyone settled into their respective grooves. The South Perth foreshore was pretty busy with other walkers, cyclists and people generally enjoying a fine morning in the sunshine. A few people had come down just to spectate and cheer on specific competitors, but the majority of people seemed surprised by the event, they cheered anyway. Running in the Australian team uniform meant there were lots of cheers, “C’mon Aussie!” It felt good to represent your country. Ian and I ran a steady pace, enjoying the slight headwind which helped to keep us a little cooler. At the drinks station just before the Narrows Bridge (5km), I paused to grab one of my pre-positioned drinks, but couldn’t find it! There was supposed to be a table for the Australian Team drinks and another table for the rest-of-world, and I was standing in front of the Australian Team table. The drinks were supposed to be lined up in order according to your bib number, so I looked and looked again. Nope, not there! Bugger. I grabbed a cup of water and an electrolyte drink and kept going. At the Crawley turn (10km), I approached the drinks station with a touch of trepidation; what if my drinks weren’t here either? Fortunately, I spotted my drink and gel from a few metres away and was able to grab them without difficulty. Ian grabbed a drink or two also and slowed to consume them, so I waited. He mentioned to me that he wasn’t feeling the best and that his stomach was giving him some grief; he thought the water might help, but it didn’t. Ian soldiered on from the Crawley turn until just before the Old Swan Brewery (13km) when he said that his gut was defeating him today and that I should just go on without him. His pace was spot on up until this point, but he wasn’t going to be able to continue today, so I had to leave him behind. This was a stroke of good fortune for a female runner, who, just as I had left Ian, collapsed right in front of him! Ian stayed with the runner providing her comfort, whatever drinks he had and generally looking after her until more aid arrived. Just as this runner was assisted into an ambulance, another runner collapses in front of Ian and he saves the day again! Ian didn’t finish the Marathon himself, but made his own way back to Burswood to formally withdraw from the event, DNF. The event organisers later awarded Ian a finisher’s medal for sacrificing his event to help others in need. At the Crawley turn, I had mentioned to Ian to be careful about over-heating as the light breeze was now at out our backs and the cooling effect was significantly less. After I left Ian at the Old Swan Brewery I had to decide whether I was going to salvage something from the run, or whether I’d just continue to “potter along”. I was feeling very warm so the weak part of me said to just potter on to eventually complete the course. Just then I started arguing with myself that this was weak and I should pull my finger out, hot weather or not! I increased my pace from 5:34/km to faster than 5:00/km and gritted my teeth. After going over the Narrows Bridge for the second time (of four) I found myself at the drinks station again, and again, I looked but could not find my bottle. I am very prone to cramp and sweat profusely, so my hydration and nutrition is quite important to my finishing an event. Each bottle I had placed around the course contained the right amount of Tailwind (a sports drink powder) and energy gels to get me to the next station where I could grab another serve of my specific hydration and nutrition. I’d already missed out on one dose of my customised needs, and now I’d miss another. This did not bode well as the temperature was increasing and I was now running harder than I had originally planned. I made it back to Burswood to complete the first of the two laps required for today. I ran to the drinks station and grabbed the first bottle which I could identify as mine. I was a little upset when I realised that it was my “spare” bottle which I had included for “emergency” use. I looked around where my spare was bottle was located on the table and could not see my “proper” bottle for this station; I looked a little further up the table to eventually locate it. Why were my two bottles at this station separated? I thought the bottles were supposed to be arranged in accordance with the bib number of the runner? Needless to say, I was happy to have both bottles in my hands, but I was peeved that something was awry with the organisation of the drinks stations. I sculled one bottle down and tossed the empty container to the side. I scoffed down a gel and grabbed a cup water before leaving the drinks station; all in a few metres! I carried the second bottle with me; I was behind on my plan but had to be wary about consuming too many calories too quickly as this leads to stomach cramps and bloating. I ran through the tents and crowds of spectators near the WAMC rooms happier than I was on the way in. It was getting warmer and windier. I was still travelling at good pace and felt pretty good. I was passing a few runners whom I had mistaken for half-marathoners, but seeing as the half-marathoners finished their event at Burswood, anyone who was in front of me was in my event and needed to be chased down. I barely remember saying a word to anyone in the last half of the race; I waved and smiled when I could but I saved my breath for me. I drank my bottle just as I arrived at the South Perth drinks station (manned by Didi, Natalie, Feli and other parkrunners) I yelled to Didi for “lites” which she didn’t understand as me asking for a cup of electrolytes, but got a cup of water instead. A little while later I arrived at the Narrows Bridge drinks station and lo-and-behold there’s one of my bottles! 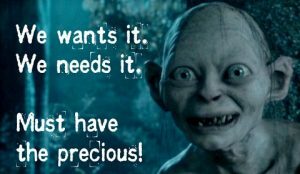 I grabbed it gleefully, and scurried away with tucked under my arm; ala Smeagol and his precious! The wind was at my left shoulder as I crossed the Narrows Bridge for the third time; it had intensified but was still hot. I got around onto Mounts Bay Road and looked across Melville Water to see a band of even stronger wind coming down the river; it hit me just before I got to the Old Swan Brewery. I pushed along into the headwind, taking comfort in the fact that the wind was helping to cool me a bit and was blowing the constant stream of sweat from my peaked cap away on the breeze instead of it leaking down my face and into my eyes. I was now grabbing cups of water from the drinks stations and pouring them over my head to try and keep cool; I hadn’t done this before so was pleasantly surprised at well it works and even more surprised at how the water soaked into my uniform shirt, which made it stick to my skin and prevented more chafing under my arms! I took my drink bottle, gel and more water from the Crawley turn and headed back along Mounts Bay Road for the final time. The wind was at my back as I pressed home for the final 10km. At times, I felt like I was suffocating as the breath that I had just exhaled was inhaled again as it moved along on the wind at the same pace as I was moving! I poured a few more cups of water over me as I went through the Old Swan Brewery drinks station, when I should have drunk at least one of them. I started to cramp in my calf muscles just as I was running down from the Narrows Bridge for the final time. I got to the Narrows Bridge drinks station for the final time. I needed my drink bottles, so stopped to look at the drinks table. My drink was not there. I backtracked a couple of metres to look at the other table, my drink was not there either. I asked one of the volunteers where the Australian drinks were and she pointed to the first table at which I had looked. I looked again and my drink bottle was definitely NOT there. I had placed four bottles in the buckets for that drinks station and I was only able to recover one. I was behind on my hydration because I was pouring water over me to cool myself instead of drinking them, I was behind on my nutrition as I’d only taken in half of what I should have consumed, I was behind on my electrolytes, and I was starting to cramp! There was only about 5km to the finish and I’ve gone a lot further than that with much worse cramping issues, so I swallowed my frustrations, said thank you to the drinks station volunteers anyway and headed for the finish. I had to take a couple of walking-stretch breaks in those final kilometres, but as I came under the Causeway for the final time, I could “smell the barn” and increased my pace for a final push to the finish. I had started with Ian running at average pace 5:35/km for the first 13km, then averaged better than 5:15/km for the remainder (including a couple of walk breaks and a stop at the drinks station). It was far from my best effort, but I was happy.